Inspired by a contradiction - what if extravagance could be down to earth? An experiment into unpretentious luxury, Boy Smells gives you permission to forgo expectations and embrace your elemental self. Boy Smells takes traditional concepts of masculine scents and wraps them up in tender, feminine notions. Picture Cinderose, a delicate red rose wrapped in ephemeral smoke. Picture Gardener, sun-ripe tomatoes on the vine, and sweet honeysuckle. Picture Kush, a blend of delicate white flowers and amber, with a hint of the green and dank. Hailing from Los Angeles, Boy Smells candles feature a blend of all natural coconut wax and beeswax. Blended and developed in the founders’ home, Boy Smells has always stayed close to its niche, small batch beginnings. All candles are still hand-poured into reusable glass, and labelled by hand in LA. Which Boy Smells candle is the best for me? I love scents that are warm and complex. 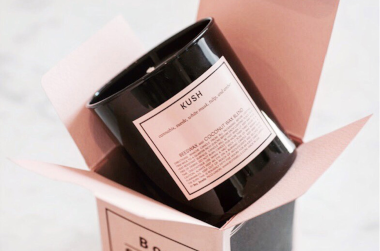 If you’re looking for something sensual, Kush Candle is the perfect balance of bright and unassuming, yet mysterious. White musk and suede mingle together with a surprising note of cannabis flower, grounded by comforting amber. Rich florals are my thing, but I don’t want something overwhelming. Rediscover night-blooming flowers with Boy Smells Petal Candle. An intoxicating yet airy and clean blend of rich florals, magnolia and jasmine take forefront. Indolic, luscious and summer-fresh. I prefer woody, earthy candles. A comforting blend of smoke and precious woods. Boy Smells Ash Candle is reminiscent of incense, with clean, almost imperceptible notes of lemon and mint. I love a classic, fresh rose. Try a twist on the world’s most loved floral. Cinderose is at once freshly picked roses, with smudges of smoke and tar for a gritty yet beautiful reinterpretation of a classic. Just heaven - A beautiful warm floral with a touch of spice, I have this candle on rotation during the autumn/winter months. A must have in the living room during the fireplace and blanket months. Love the reference to celery stalks, and love the berry and earthy scent - ideal for anytime of year. Candle has great &apos;throw&apos; without being overpowering. Nice container too. Will definitely consider others in the same range.